A regular conference that I participate in as a speaker is the Evangelism Dunamis. Dunamis is the greek word for ‘power’ and used to refer to the infilling and empowering work of the Holy Spirit. This is part 6 of 6 in the foundational coursework for Presbyterian Reformed Ministries International, on the person and work of the Holy Spirit. Part 1 is always offered as a make up section in all the other parts, so that it is easy for a person to start with any of the parts in the course. I have had the joy of teaching the evangelism tract for 3 years now, and use other parts of this body of material in all our teachings through the Americas. The Dunamis Project of PRMI has as its fundamental purpose the equipping of an extended fellowship of Christians, both clergy and laity, in the ministry of the Holy Spirit all of which is for the glory of Jesus Christ. 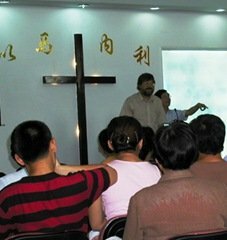 The Dunamis Project provides a setting where Christians not only receive teaching, but also begin to experience the reality of spiritual leadership as promised to us by Jesus Christ – that is to have the Holy Spirit within us for salvation and Christian character formation, and upon us for the power and gifts of the Holy Spirit enabling us to witness to Jesus Christ. 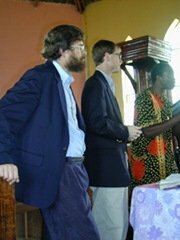 Each Dunamis Project track is directed by a Faculty member of the Dunamis Fellowship. The Director will pull together a team needed to conduct the events over a three-year period in this one location. The team will include people gifted for hospitality, administration, intercessory prayer, worship and prayer ministry. The teachers are selected from members of the Dunamis Fellowship Faculty with the advice and consent of the Pastor of the Dunamis Fellowship. The events take place either at a retreat center or at a local church. It is envisioned that the Dunamis Project will produce Holy Spirit-empowered leadership for local congregations, prayer groups, evangelism programs and mission outreach. The roots of this ministry and the creators of this course are Presbyterian and Reformed and the material is especially designed for those in the Reformed family of churches; however, the Dunamis Project is for the whole body of Christ. PRMI’s calling is to provide spiritual leadership for the movement of the Holy Spirit. Since the Holy Spirit is moving worldwide, this means that if we are obedient to the leading of the Holy Spirit and are consistent with Jesus’ purposes to bring salvation to all humankind, then the Dunamis Project will have a cross-cultural mission expression. It is envisioned that the Dunamis Project will be adopted and adapted to meet the leadership development needs of other sodalities, churches and movements within the body of Christ and the Reformed stream of Christianity that share the same vision and goals as PRMI. The Dunamis Project founded in 1991, has been offered in a number of locations around the world. It continues to grow. The Dunamis Project is . . .
Presents Holy Spirit empowered ministry in a particular manner. Typically, the course lasts Wednesday evening through Sunday morning. Registration fees cover all room and lodging, but the vision of PRMI is advanced through love offerings received at such events. Spiritual Gifts — analaysis and practice with manifestational and motivational gifts. Prayer – how to pray, and lots of time praying. The Healing Minsitry of Jesus – learning about cooperating with the Holy Spirit in continuing the work of healing. Evangelism — Personal Evangelism in the Power of the Holy Spirit. I need the material of Dunamis Project. Do you can send me?